Tuesday’s keynote session was opened by Mindy Grossman, CEO of HSN, who shared thoughts on the retail industry and its future. Grossman noted that if you are not willing to disrupt, you will be disrupted. The conversation has changed over time from multi-channel to omni-channel to disrupted commerce, which refers to consumers being able to purchase any product, anywhere, at any time. It is “boundaryless” retailing. No matter the size of your company or the length of its existence, it is critical to continuously reinvent yourself as a company and adapt to the changes in your industry. Constant reinvention is about service, trust and integrity with regard to your customers. Read the full report for full insights from Chenault and Lundgren’s discussion. 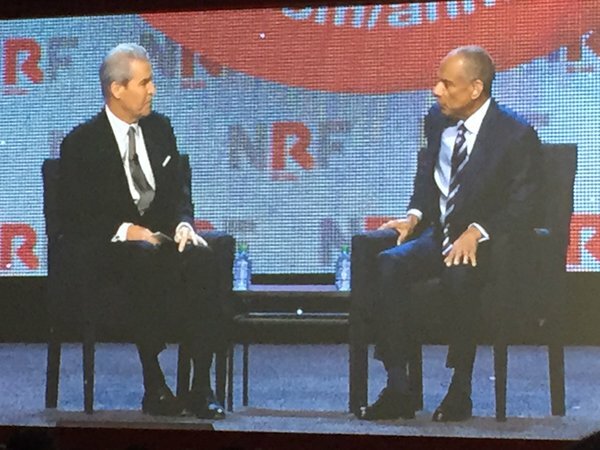 Westfield Co-CEO Steven Lowy focused on collaboration and how beneficial it would be for retailers and mall owners/operators if they shared data and used it to provide a seamless experience for customers. Lowy believes that collaboration is the new competition. He said that customers are not aware of who generates data or who uses it—all they are concerned about is their experience. Sir Charlie Mayfield began his presentation by outlining John Lewis’s business. The company operates John Lewis department stores as well as Waitrose, an upscale grocery chain. John Lewis stores are a bit different than traditional American department stores: the mix is one-third apparel and beauty, one-third home, and onethird consumer electronics and appliances. 40% of John Lewis’s holiday sales in 2015 were generated online, as were 15% of Waitrose’s, a significantly greater proportion than for any comparable retailer. Under Armour’s Kevin Plank said it was important for brands to tell a story. When he was a college athlete playing football, he noticed that he and his teammates had to change their undershirts frequently because they quickly became soaked with sweat. That led him to base the company around a compression shirt. The offering has since expanded, but shirts and shoes remain Under Armour’s core offerings. The company’s retail channel began as a liquidation experiment and later became a way for the company to communicate its brand messaging to consumers. More from the Under Armour, John Lewis and Westfield session. RAIN RFID is a wireless technology that connects billions of everyday items to the Internet, enabling businesses and consumers to identify, locate, authenticate and engage items. It is based on a UHF RFID protocol standard developed by GS1 and ISO. Our breakdown of the full session. “Data is central to Williams-Sonoma culture,” stated Sameer Hassan, the company’s VP of E-Commerce and Marketing, as he began a Q&A session about how his company leverages data. Williams- Sonoma, which owns brands such as Pottery Barn, PB Teen and West Elm, receives 50% of its revenue from its e-commerce business. Hassan claims that the data-driven culture starts with the CEO. “You can’t go into an executive meeting without data to support your ideas,” Hassan said. “When I was invited to my first executive meeting, the first question the CEO asked me is if I A/B tested our ideas.” This mentality drove the company to optimize different areas of its business using data and analytics. Read on for full insights from the Williams-Sonomoa and Terdata. Be sure to read the full report for further analysis and additional coverage of: 84.51 and The Kroger CO. Plus our highlights from “E-Mazing–The Unstoppable Power of the Online Marketplace”, “Connected Stores: How to Serve the Digital Customer” and “Killer Apps, Beacons, Wi-Fi: Revitalize the Brick and Mortar Experience”. 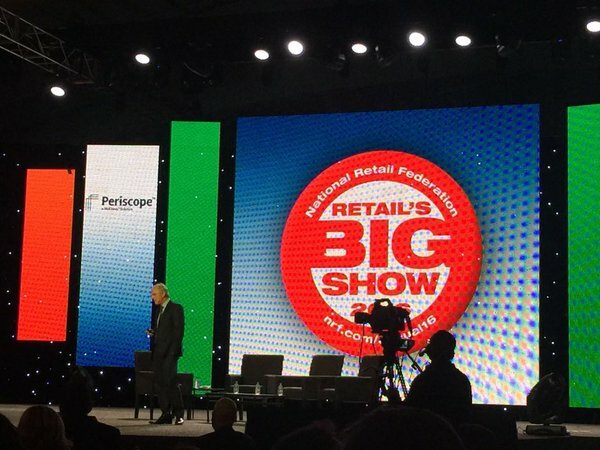 Thanks for following our coverage of NRF – Retail’s BIG Show 2016! If you missed our coverage of Day 1 and Day 2, take a look back at our insights from the last few days at the show. To receive more from FBIC, you can subscribe to our Daily Feed and Weekly Insight emails direct to your inbox, for all the latest updates in retail and technology.